Gina Alvarez has been working in the academic and non-profit sector in St. Louis for over ten years. She led Washington University students in their semester abroad travels and taught printmaking at several colleges and universities around St. Louis. She has also managed and booked exhibitions for several venues including Fort Gondo Compound for the Arts. Most recently Gina was the gallery and education director for the St. Louis Artists’ Guild and Galleries. She is currently the Executive Director for VSA Missouri, the statewide organization on Arts and Disability. Kelly is a self-taught artist, who has been creating since childhood. 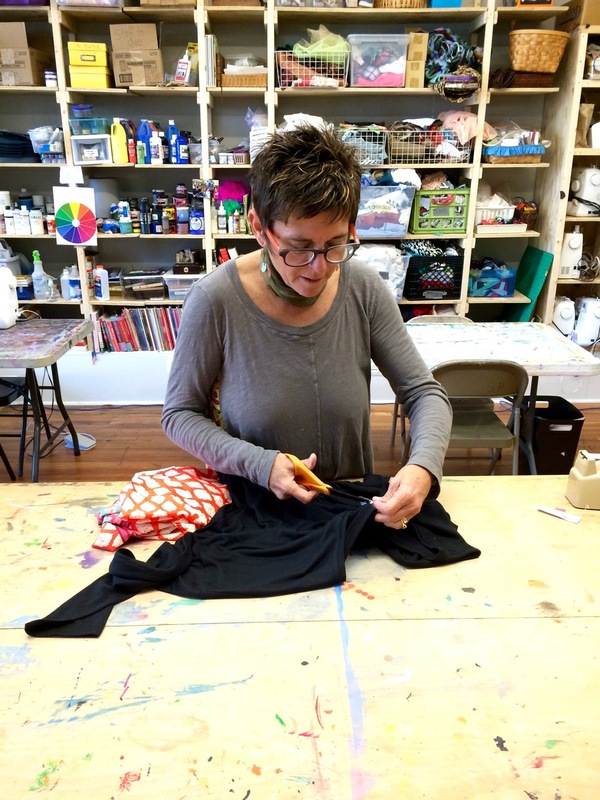 She has been teaching fiber arts and sewing for eight years. Her work has also been in numerous art shows, galleries and shops. Kelly is the founder of Spirited Hands Art and the Women’s Art Collective, which is a group of women who create and share to help make our communities better through art. Kelly has had an art studio on Sutton Blvd. for eight years and, along with her son, founded the Turner Center for the Arts in June 2006. Kelly has a Bachelors of Science in Special Education and Sociology and has supported people with disabilities for over 30 years. Jeremy Rabus is an artist currently living and working in St. Louis, MO. He received a BFA in Painting from Southern Illinois University in 2004. He has exhibited across the region in venues such as Jamie Brooks Fine Art (Costa Mesa, CA), Front/Space (Kansas City, MO), Hoffman LaChance Contemporary (St. Louis, MO), Mad Art Gallery (St. Louis, MO), Snowflake/City Stock (St. Louis, MO), Fort Gondo Compound for the Arts (St. Louis, MO), the St. Louis Artists’ Guild, and the Ethical Society of St. Louis. In December 2013, he exhibited with Hoffman LaChance Contemporary at Aqua Art Miami, an international art fair. Rabus is represented by Hoffman LaChance Contemporary and Jamie Brooks Fine Art. He is an educator as well as an artist, teaching classes and workshops in color theory and painting. Sign up to receive news and updates about the Living Arts Studio and VSA Arts of Missouri.